The Clear + Brilliant treatment is a revolutionary non-invasive laser treatment that fights the natural effects aging has on skin. This gentle treatment helps improve dull, sun damaged skin by creating a more even skin canvas. The Clear + Brilliant laser treatment is most often used to help prevent the signs of ageing and to reduce the appearance of open pores. It can also reduce the appearance of scars, excess pigmentation, tighten pores and improve overall skin texture and tone. 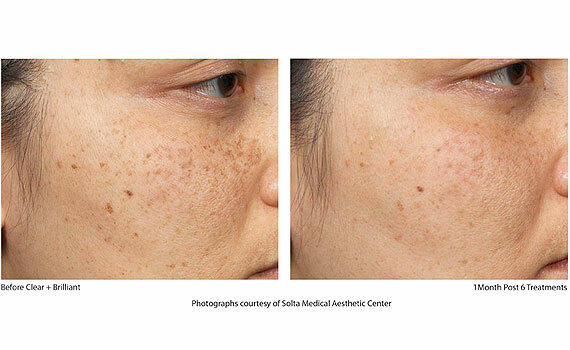 The procedure is comfortable, affordable and safe for all skin tones. Clear + Brilliant is perfect for both men and women who want a radiant, youthful glow with minimal downtime. Reduce the signs of aging and keep your skin looking younger and glowing. The laser used in the Clear + Brilliant treatment is non-ablative meaning that the laser heats up the target tissue target tissue without actually destroying it. This is what makes the Clear + Brilliant treatment and other non-ablative lasers much less invasive than ablative laser treatments such as the Sciton ProFractional laser. Clear + Brilliant works by creating an array of microscopic lesions across the surface of the skin from the heat of the laser. These microscopic lesions are surrounded by large areas of healthy skin to help promote quick healing with little to no downtime. The healthy skin helps promote quick healing of the tiny lesions within a matter of days, revealing the healthier, smoother skin below. The damage to the skin stimulates the production of collagen which helps to plump and smooth out imperfections in the skin such as acne scarring. *The before and after photos below are just an example. The results varies from one patient to another and there is no guarantee that all patients who will have this procedure will have similar results. What happens on the day of my treatment? Firstly, a local anaesthetic will be applied to the area about 30 minutes prior to treatment. Then, the Clear + Brilliant treatment will be carried out by one of our highly trained specialists. The laser treatment itself takes between 20 to 30 minutes. During the treatment you may feel a slight warm sensation. After the treatment there will be redness on the treated areas. This will begin to subside within a few hours, lasting up to 48 hours. The procedure is quick and an ideal alternative to several more intensive treatments as its gentle laser means minimal downtime. What area of the body can be treated with the Clear + Brilliant laser? 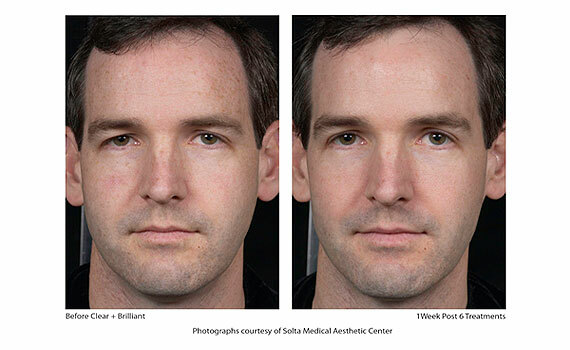 The Clear + Brilliant laser is most frequently applied to the face for facial rejuvenation. It can however be used to rejuvenate skin in other areas such as the neck, chest, hands, and other areas of the body. The treatment provides a refreshing boost to the skin. 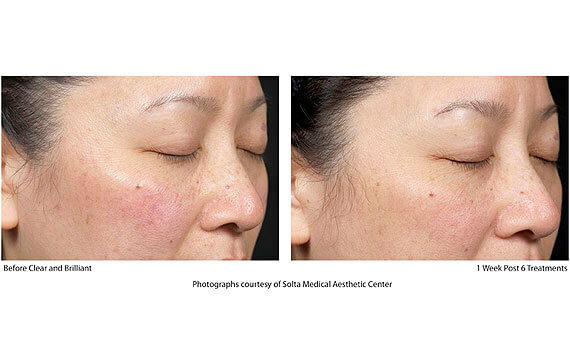 We recommend a series of 4 to 6 laser treatments given 2 weeks apart. The number of treatments you need will be decided on during your consultation. The specialist will help you come up with a personalised treatment plan based on the results you want to achieve and the area or areas you want treated. If you are satisfied with the results in fewer sessions than recommended you can decide to stop the treatments or to continue with the sessions, it’s entirely up to you. Many patients decide to make the Clear + Brilliant laser treatment a part of their skin care regimen in order to maintain a youthful appearance and radiant glow. The gentle nature of the laser means that patients are able to continue having the treatment as often as every 2 weeks. Yes. Clear + Brilliant was approved by the FDA in May 2011. Dermatologists nationwide have incorporated this device into their practices and use it daily. The non-ablative laser in Clear + Brilliant allows the top layer of skin to remain intact which results in a safe, low risk treatment and quick healing. Who should not have treatment with Clear + Brilliant? Having significant redness in the area of treatment from skin conditions such as actinic keratoses, eczema, psoriasis, rosacea etc. If you are planning to have Botox or dermal filler as well as the Clear + Brilliant treatment, we will start with the Clear + Brilliant and then continue with the Botox or the filler. If you have already had Botox or filler treatments, we recommend waiting two weeks before the Clear + Brilliant procedure. The actual treatment takes between 15 to 20 minutes. We recommend that you arrive 30 minutes prior to your appointment for the anaesthetic cream to be applied and to take effect. This is included in the cost of the procedure. Does Clear + Brilliant hurt and what will my face look like after the treatment? During the treatment you may feel a warm sensation in the area being treated. A topical anaesthetic cream is applied before you begin the treatment to minimise any discomfort you may experience. Although your skin will look red after your treatment, this redness should resolve within the next 12 to 24 hours. Results can be seen as early as the same day; your skin will feel smoother and appear more refreshed and radiant that evening. One of the many advantages of Clear + Brilliant is that after completing the recommended series of treatments, results do not fade if proper skin care is practiced. Patients are advised to continue wearing sunscreen to prevent further pigmentation and sun damage. We recommend coming in for touch up treatments twice a year (or before special events) to maintain your results. How should I prepare for the Clear + Brilliant treatment? In preparation for your treatment, we advise patients to avoid using Retinoids (found in some acne and anti-aging products) at least two weeks prior to the treatment day. 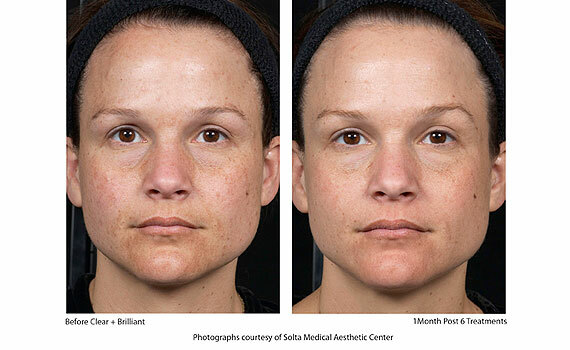 Clear + Brilliant is designed to minimize the side effects of traditional laser treatments. Immediately following your procedure, you may experience transient redness and swelling. We recommend that you do not apply make up for the remainder of the day. The redness and swelling will resolve within by the next morning. You may continue with your daily routine, but we do not recommend activities that involve sweating. Patients should avoid the gym, sauna, steam room, and facial or massage treatments on the day following your treatment. As the skin begins to heal, you may notice dryness. We recommend you use a bland moisturiser to lessen any dryness experienced after your treatment. Exposure to the sun before and after the treatment should be avoided. The skin is more sensitive to the sun following treatment and sun exposure can increase the risk of unwanted pigmentation. Following treatment, patients are urged to apply a high SPF sunscreen (30 or higher) daily. For more information regarding the Clear + Brilliant laser treatment please contact us on 020 7467 3720.